Roadway Construction Service employs multiple experienced and certified traffic control plan design specialists and Civil/Traffic Engineers. Traffic control planning requires forethought. A Traffic Control Plan plays an important role in providing safe and efficient traffic flow. Interruptions in normal flow are necessary for temporary traffic control operations. The temporary traffic control zone includes the entire section of roadway between the first advance warning sign through the last traffic control device. Most temporary traffic control zones can be divided into four areas: advance warning area, the transition area, the activity area, and the termination area. All of Roadway’s temporary traffic control plans are engineered to be site-specific showing all current conditions, drawn to scale, and in accordance with the most recent Federal & California state guidelines, and the requirements of the responsible Agency. 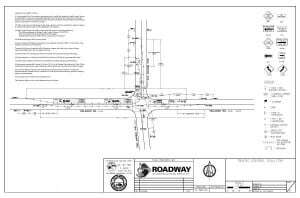 Roadway is committed to using all new and available technology to produce a custom traffic control plan in the safest and most efficient manner possible to assist with completing your project, the Roadway way, on-time, on budget, safely. Traffic control planning for major construction projects and special events begins with the city itself. What are the expectations of the local officials? For RCS, this means plugging into the city decision makers and learning about their needs. This is a necessary step for every project. Each city in Los Angeles and surrounding counties are different. Requirements for Torrance might not even be close to those of Santa Monica or Hollywood. One thing all cities have in common, however, is public safety and a desire for minimal impact on the community. In order to meet minimal impact expectations and safety requirements, RCS coordinates their game plan with key personnel at every organization involved. Analytic ability is one of the many assets that distinguishes the members of our planning team. Marshalling formidable skills, they look deep into a situation, considering all aspects and weighing every potential outcome. One of the objects on their radar is the prospective work zone – the location where all action unfolds. Work crews, vehicular traffic, pedestrians, bicyclists, and other factors may be in motion simultaneously, depending on a site’s layout. How should all these variables be coordinated to maximize safety? Planners must ascertain the answers. Additionally, Roadway Construction Service planners must set this field of action against a backdrop of physical characteristics. These include a site’s topographical features, square footage, expected road conditions, possible hazards and other risks, and vulnerability to forecast weather. Then comes the really challenging part – our team must compile the accumulated data, scrutinize it top-to-bottom, tie up all the loose ends, and stitch it together into a practicable traffic control plan. Easier said then done. But for the Roadway Construction Service squad, it’s par for the course. There’s another side to our master planners – the social side. Every member of our team is highly skilled in the area of human relations, able to interact on a high level with key decision-makers. This social connection is crucial – it is these decision makers who approve or deny permit requests. Without their blessing, forward movement is impossible — the traffic control plan is put on indefinite hold. The decision-makers – various business leaders and municipal officials – are not exactly an easy group to please. In fact, they’re tough as nails. They must be. Being responsible for a given area, they naturally want everything to run like clockwork. Anything less is unacceptable. Fortunately, the Roadway Construction team understands their needs and expectations. Our planners know all applicable codes and regulations, routinely making sure all are satisfied before submitting a permitting request. The result is a stellar record of rapid approvals. This helps to keep projects on track and on schedule – and clients free from the worry of costly budget overruns. Our socially-skilled strategists must deal with one other group of people during the planning stage – work crews. Among the questions to be considered are — How will personnel be deployed? and How many will take the field? Answers will vary, depending on a wide range of circumstances. Flaggers take center stage when it comes to people deployed for a traffic control project. On their shoulders is the major responsibility of maintaining order and ensuring maximum safety. Given the obvious importance of flaggers, planning teams select them with consummate care. 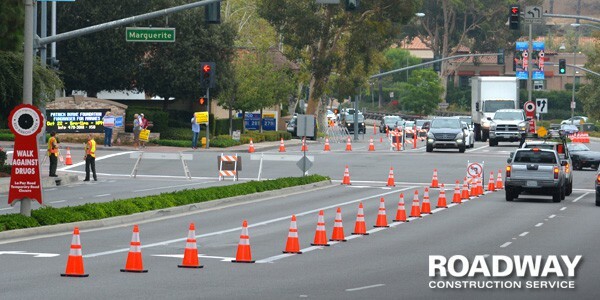 Planners exhibit the same precision when selecting deployed hardware – the traffic control barricades. Complementing the work of flaggers, these barriers help keep motorists and pedestrians on safe paths and prevent their encroachment into restricted areas. At Roadway Construction Service, planners must choose from a wide range of road barriers. These include everything from massive k-rail, the necessary solution when wall-like strength is required, to high-visibility traffic cones. Here, thoroughness rules – a thoroughness that further demonstrates the lengths we’ll go to formulate a flawless traffic control plan.